In my mind however, I don't think that the rise of multimedia usage on our phones should lead to the destruction of easily pocketed one handed devices. For instance, I love my iPhone because I can keep it in a tight pocket, use it with one hand (unlike my Nexus 7 or the Galaxy Note which usually requires two unless you are Lebron James), and to top it all off I can still watch videos, play games, and browse the web. The one area I will say having a larger screen is beneficial is book reading. But in that case I would opt for an e-reader (or in this case my Nexus 7), because I imagine that the jump from a 3.5" iPhone 4S to a 5.5" Galaxy Note II still isn't enough to make magazine and novel reading too much more pleasurable. Having used both a Nexus 7 and 4S frequently, I can say that even the jump from 3.5" to 7" is negligible when simply browsing the web. Most websites and forums are optimized so that you can read text easily even on a 3.5" screen, so that hardly ever becomes an issue. The main area where I see larger screens having the advantage is in movie playback, but then again your phone's battery won't last long if you are planning to view full length HD video when you are away from your charger. I am not saying that the larger screens on Androids aren't worth it, as I know many enjoy them. All I am trying to get across however is that there are people (like me) who are completely happy with a phone with a slightly smaller screen that allows for greater portability and easier one handed usage. Having had a giant Android device (the Nexus 7) and an iPhone (the 4S) by my side for some time now, I can say that my personal experiences have only reinforced these sentiments. I honestly can say that I don't believe Apple had to go with 4" on the iPhone 5. Those who asked for it likely went with larger Android handsets anyways, and current iPhone users aren't really going to see much of a difference besides the addition of one extra row of icons. I am of the opinion that if Android offered smaller flagship devices (around 3.5" to 4"), they would be just as popular as the Galaxy S3, Note II, and other large handsets. 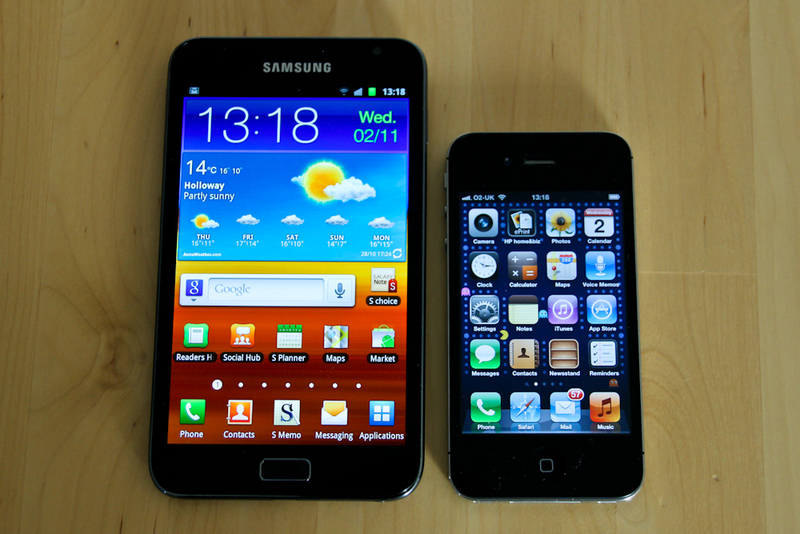 There is definitely a market for these types of phones, as evidenced by the continued success of the iPhone 4S and even the iPhone 4 among smartphone buyers to this very day. Though there is no way to make everyone happy, if I were Apple I would nix the iPhone 5 design and create two models: a 3.5" model based on the iPhone 4/4S, and a 4.5" model (keeping the 3:2 aspect ratio, the 16:9 on the 5 is much too elongated in appearance). That way, you get everyone who loves the portability and one handed ergonomics of the original iPhone, and also get a chuck of the the people who want the larger screen real estate for videos, gaming, and reading. In my opinion, the 7" tablet is the best device if you need a device to play games, read books, and watch Netflix on the go. But others disagree, and for that reason phones from 4.5" all the way to 6" will continue to be developed. That, however, does not mean that phones around the size of the original iPhone should be scrapped and burned, never to be seen again. There is still a vast market that prefers this type of device, and it would be nice if Apple and Google recognized this and continued to make smartphones that cater to this specific group of consumers. In the end, it all comes down to offering people what they want, and it is clear that there exists a need for small smartphones, large smartphones, and all that lies in between.